A simple search or two will reveal Iran Contra pardons the only thing Barr had his hands on. But back up a little. Bush 41 befriended Barr while Barr was employed at CIA (73-77), working days and going to George Washington U Law School at night. He got his Jurist with high honors 77. He then worked as a legal clerk for judge Malcom Wilkey, U.S. Court of Appeals for the District of Columbia circuit. He served Reagan 82-83, in 89 GHW Bush appointed him U.S. D.O.J. assistant AG for the office of legal counsel, an office that serves the executive. In 1991 GHW Bush appointed him AG after Richard Thornbird resigned to run for Senate. Barr hired retired Chicago judge to investigate the Inslaw scandal, no wrong doing by DOJ the judge said. That is maybe because many the journalists investigating ended up dead. 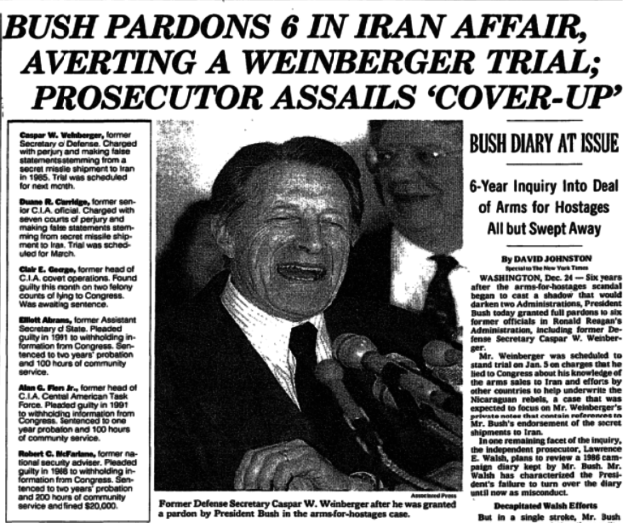 Then December 1993 the Iran – Contra pardons, including Barrs call for Casper Weinberger to be pardoned before the atrial. So Barr as far as I l can tell is a CIA shill. I agree with Ralph Nader but maybe for different reasons. My take is the Dimocraps are giving away the rule of law by supporting this man. Once a CIA supporter always a CIA supporter, especially when GHW Bush was your guy on the inside. CIA has not been so exercised by one man since the Church Committee hearings. I think it is because they have reasons, internal reasons. Maybe Mueller needs to cover for them if he can. Barr as AG would make it easier for Mueller to do so. Well worth reading is an article in antiwar.com by David Stockman on the Russiagate writeup in the NYT by three “journalists” lacking the slightest clue about history. The problem with Osama Husseini’s attempt to draw comparisons of illegal activity by George H. W. Bush and Trump is that there is zero proof that Trump is guilty of “collusion” or “obstruction of justice” while it was always clear that crimes were committed in the Iran Contra case. There certainly were crimes committed during the 2016 campaign and after Trump assumed the presidency but they were not Trump’s but rather those of the FBI/DOJ, CIA and NSA most likely initiated by Barak Hussein Obama. Hopefully, Barr will actually conduct a real investigation unlike the desperate and dishonest activities of the corrupt Mueller. Sorry – should have proof read what I wrote before posting. Corrections capitalized. Thank you very much for this article, Mr Husseini. Not that the information within it surprises; rather, it only adds to the deep despair at the continuing and profound hypocrisy in which this country and the other western countries are steeped. This despair is furthered whenever I check out what my late husband’s FB friends – all very well-educated, many also decidedly bourgeois (socio-economically) and “progressive” (whatever that means). Their postings indicate that whether they voted for HRC or not, they didn’t for the Strumpet and that anything that anyone does to undermine him is good and that they, the underminers, are to be fawned over, supported. If even well-educated people drink the Kool Aid supplied by the MSM and the neo-liberal, so-called “progressive” “alternative” media, then how can it be expected that those without little education, little time and less money to devote to searching for truly alternative views, understandings, perceptions? What I do know is, they don’t read CN, Global Research etc. Thank you, Sam Husseini. If Robert Parry were still with us, this is probably an article he would have wrote. Unwanted truths are flushed down the memory hole. History is just a narrative to be written by spin doctors. The people are too ignorant and preoccupied to question the tales their masters create for them. 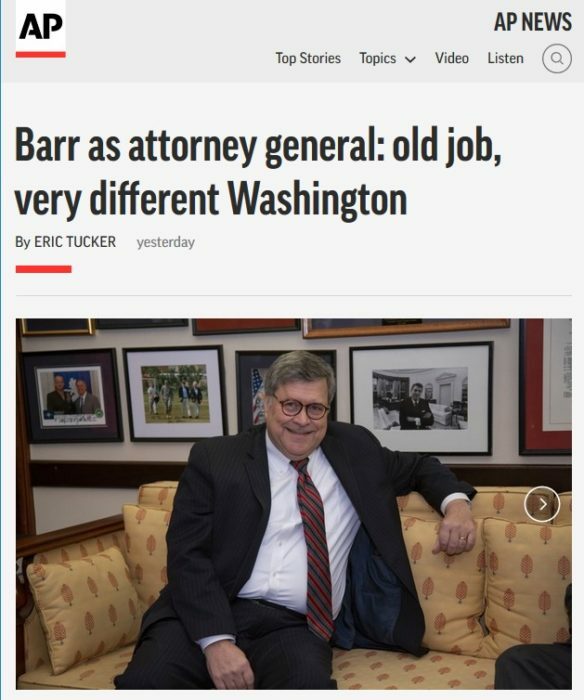 you loved Sessions, you will adore Barr. Isn’t this so typical of this Country called America? If one of these elites such as Barr with his dodgy Iran Contra links or Bankers who break the law & cause a financial meltdown in 2008, what does the US Govt do?? They change the law to make illegal actions legal, then bail out the Bankers with billions of Taxpayer money & reward the very people who caused the crisis? In the Iran Contra deal, Reagan knew exactly what he was doing was illegal conduct but did it anyway! Today he is revered, eulogised, mythologised & held in esteem, but the man was a nothing more than a common Tyrant with blood on his hands & responsible for the deaths of thousands of Sth Americans! And now this Barr is getting his record whitewashed & pardoned for past Crimes? Only in America could this happen? This two tier justice system is another reason why the US is only ranked #21 in the World’s Democracy rankings! The question could even be asked whether this Nation is it even a Democracy at all, despite its high faluting ideals & supposed exceptional Constitution? It’s more like a Obligarchy, run by a Neoliberal, Feudalistic Society of Global Elites with its Citizens as serfs? Contrast that with the common man, or worse, being a black man in America? Get caught jaywalking or spitting on the street & you get thrown in jail for years or worse , shot to death! America, land of the free & home of the Brave! We can note the truth of Chomsky’s comment that every POTUS since WW2 would have been hanged if the Nurenburg Trial rules had been followed. Also, most crimes of Nixon and his mates are now legal. It is a historical fact spelled out by Robert Parry in his numerous articles that Bush met with Iranians to keep the US hostages in Tehran so as to deny Carter a win. 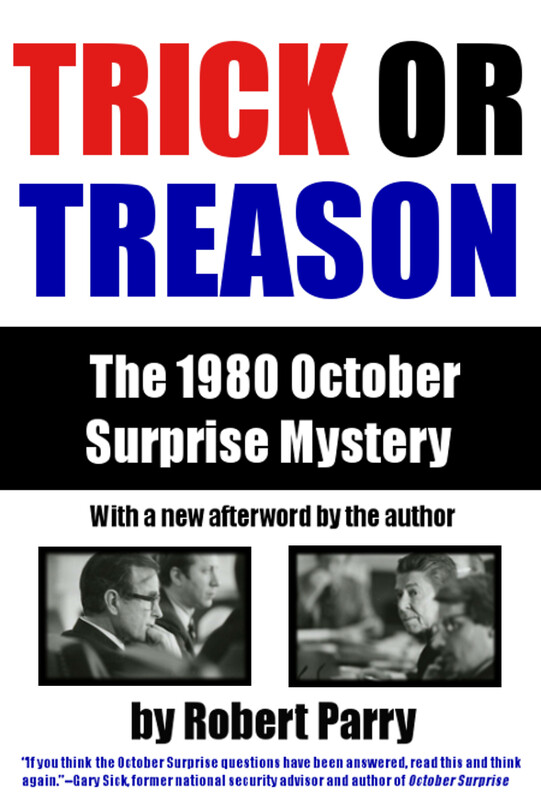 The motivation of the denial of an October surprise during the election campaign of the Reagan Bush ticket was based upon the fear that the master negotiator, Jimmy Carter, who had successfully demonstrated his prowess as an international peace negotiator securing a peace between both the Palestinians and the Egyptians with Israel would also succeed in negotiating the release of the Americans held hostage in Iran. All efforts of the republicans were aimed at denying Carter a second term. The media was full in force as well daily describing Carter as a recluse in the Rose Garden in the White House fecklessly trying to make progress in the hostage crisis. Day after day the media reported that the feckless Carter further and further retreated into a fantasy garden where he sniffed flowers remorseful of his own incompetence to effect the release of the hostages held in Iran. 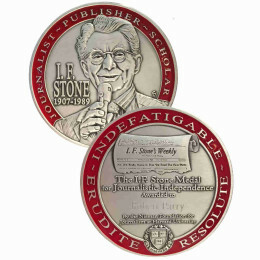 Carter was portrayed as weak while Bush was selling arms in exchange for the continued incarceration of the hostages. The reason for this cooperation was the fear by the establishment that the ultra liberal Carter administration would secure a second term if the hostages were released under Carter’s administration. It was late in the campaign and the republicans had a nightmare in their eyes. The nightmare scenario was that Carter, the master negotiator would work his magic as he had done with the Palestinians and the Egyptians would work his magic with Iran and magically secure the release of the American hostages in the days leading up to the national election. If Carter succeeded then there would be ticker tape parades in New York City and Washington and Carter would be hailed as a hero thus assuring he would win. In fact that was exactly what Carter was doing in his secluded oasis in the hidden sanctuary of the Rose Garden which was portrayed by the press as a hermits withdrawal from reality and a disconnection from the concerns of the political campaign and the politics with Iran. The media portrayed Carter as a lame duck leading up to the election. He was portrayed as an impotent president incapable of every task that a sitting president was expected to do. He was portrayed as a hermit hiding in the Rose Garden awaiting his inevitable defeat like some modern Nero fiddling while his chances for reelection dwindled. The story of how Bush secretly met with the Iranians and offered them millions in weapons in order to deny Carter reelection through the continued hostage crisis is actually generally recognized today to have happened. Republicans say so what we won. Get over it. The Iran Contra investigation was snuffed by Congress as the special prosecutor Justice Walsh closed in on the evidence that all of this was really real. The Congressional investigation was literally shut down. 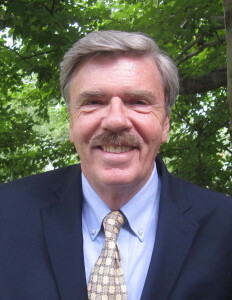 Laurence E. Walsh wrote a book about the massive coverup by Congress and the Reagan administration in the Iran Contra affair titled “Firewall”. He described how his role as special prosecutor in the Iran Contra investigation found evidence that the arms for cash deal with the Iranians extended further back than anyone anticipated leading back to the early days of the Bush Reagan campaign for president. He described how a firewall of obstruction and refusal by the White House and members of Congress to provide information ultimately resulted in thesudden abrupt shutdown of the investigation. In hind sight we can see the complete control of the republican party even way back in the 1980s and the cooperative efforts of the commercial media in cooperating with the depiction of President Carter as weak and ineffective while they ignored the possible implications that a sitting US President and Vice President had conspired to prolong the captivity of US citizens held on foreign enemy soil inside an enemy nation we had no diplomatic relations with to gain political advantage in a national election. No doubt that there were grave concerns in Congress that such a revelation would do tremendous harm to the international image of the USA as a bastion of democracy and a leader in the rule of all laws including national and international laws. It would also likely stain the republican party with the ink of treason. Such an event was not something that the power establishment could stomach so they buried it along with the media which reported that the reason that the airplane filled with the hostages were released within minutes of Reagan’s Inauguration. The media ignored the underlying reasons ans went with a story about how the weak Iranians were thunder shocked by the forceful incoming president (Reagan) and released the hostages at the last minute because they feared what the mighty republican president might do in the hours or days after he was elected. There was the fait accompli that the incoming administration depended on the media to provide and they did so in grand fashion unquestioningly. So Reagan rode into power with no question by the main stream media about why the Iranians released the hostages other than the conclusion that the mighty team of Reagan and Bush had caused the Iranians to piss their pants and hastily release the hostages literally within the minute that Reagan was sworn in as president fearing the mighty president would unleash his arsenals against them whereas the weak Carter administration dithered and dallied the time away leading to their defeat in the election. The late Robert Parry wrote much about this usurpation of our democracy by those who under any measure of US or military law would have been defined by their actions as traitors to the American Constitution. The articles of impeachment under the US Constitution describe High Crimes and Misdemeanors as grounds for impeachment but that was not what happened to Reagan and Bush thanks to the abrupt cessation of the Iran Contra Investigations. Verra interesting. I frankly had no clue. When will be stop sanctimoniously lecturing other countries about their internal operations? I’ve long thought for a variety of reasons that it is ludicrous for us to be lecturing other countries on, say, their human rights records, etc etc. but this sort of article absolutely seals the deal on our hypocrisy. Fortunately, we have the integrity initiative to tell us these are all lies. “Best Practices in Counterinsurgency: Making High-Value Targeting Operations an Effective Counterinsurgency Tool” (.pdf) We are making it available through our website as a service to our readers worldwide. We also present to our readers Chapter 11 of the previously released CIA KUBARK manual on “Counterintelligence Interrogation” which covers “Coercive Counterintelligence Interrogation of Resistant Sources”. This excerpt from the larger document was previously released by George Washington University’s “National Security Archive”, in a censored form from an earlier FOIA release. In March 2014, this document was re-released by the CIA in a far less censored form. The “National Security Archive” is an extremely valuable online repository of declassified US Government documents chronicling the long, repulsive history of the US Government’s murderous assaults on the revolutionary and reformist elements of the workers movement worldwide. The “National Security Archive” is the source of this complete and less-redacted version of the 1963 KUBARK manual which we release here in one continuous .pdf document: 2014 release 1963 KUBARK manual_Counterintelligence_Interrogation. We would like to remind our readers that this document was produced by the CIA under the auspices and with the approval of the “lesser evil” Democratic Party’s John F. Kennedy administration. If the Deep State’s longtime DH George HW Bush, a genuine no doubt-about-it Constitutional criminal, could pardon every last Iran-Contra crook standing between him and retirement in a Federal prison cell, and Billygoat Clinton could pardon the wily but odious Marc Rich for a fistful of dollars, then The Trump, who has probably committed no “high crimes or misdemeanors” (beyond being a malignant narcissist and nincompoop) can pardon shlubs like Poopodopolous, Flynn, even the pathetic Manafort (leaving the creepy taxi medallion lawyer Cohen to stew in the clink) if he feels like it. Kudos to Sam Husseini for reminding the lynch mob in pursuit of The Trump about his self-serving predecessors. As for Obama, he pre-pardoned all those Wall Street thieves and looters with get-out-of-jail- free cards BEFORE any of them were ever even investigated let alone charged with their world-rattling financial crimes. 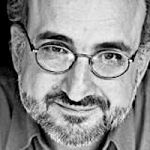 Sam Husseini, after Iran/Contra came the Contra/Cocaine Fund Raising – for weapons -in our illegal funding of right-wing mercenaries that waged war against the legitimate governments in Central America. — That lead to the Violent Increase of, and Mass Incarceration of Urban Youth by reason of the invention of Mandatory Minimum Sentencing, which was used, nationally, to build a / the ‘Prison Industrial Complex’ along with the Defunding of Urban America. The very same human beings FLEEING CENTRAL AMERICA today — THESE PEOPLE TRUMP DECLARES ARE “MURDERERS AND RAPISTS” ! ! ! ! ! ! ! ! Mild – ly Facetious – thanks for the spot on post delivered with the appropriate anger and outrage. It was the madness and U.S. sponsored terrorism in Latin America in the 1980’s that woke me up and brought me to the Central American solidarity movement. One of the great ironies of Iran/Contra, from my perspective, is that the cocaine for drugs operation was run out of tiny Mena, Arkansas while small time state governor Bill Clinton was on watch. While Bush-I ran the operation as VP to the demented president, Bill Clinton proved his bona fides to the deep state by squashing multiple Arkansas State Police investigations into the incoming drug shipments. We thus had rather amazing situation in which two future U.S. presidents were both involved simultaneously in a massive illegal CIA based narcotics operation. Not only were the CIA’s foreign policy goals met in illegally arming the Contras, but domestic policy goals were also met in terms of narcotizing dissent in and psychologically devastating poor communities and communities of color. It was thus a “win” for them on both the foreign policy and the domestic front. The icing on the cake for the CIA psychopaths running the operation, I’ve always thought, was that when the poor and disenfranchised in U.S. cities spent their money to buy that cocaine, they were in fact unwittingly funding the CIA’s efforts to murder and disenfranchise their even poorer brothers and sisters in Nicaragua. Iran/Contra was a sort of ‘perfect circle’ of amoral criminality that sheds a great deal of light on the inner workings of our utterly corrupt amoral government and it’s institutions. Great analysis, Gary. I am thinking that the same ploy continues today with the heroin market. I don’t know why I’ve been a close observer of international politics since my university days, but I have. It continues now that I’ve reached antiquity. Mild – ly Facetious and his repliers have it right, but no one, not even the Parry’s have gone far enough. Corruption at all levels has forever been there. What’s slightly different in America is that the post immigrant public of the late 19th century came from countries so rife with corruption that America seemed pretty clean. Then, say around the 1920s and prohibition, came the Mafia. During WW II the Mafia had made vast fortunes by organizing very diverse criminal activities into well organized “families” from liquor distribution to garbage removal. They ran the upper East Coast, the lower West Coast, Miami, everywhere that gambling and racing existed, and Cuba. By the 50s they were sending their offspring to universities and very often majoring in law and business. I remember being told by a major DC contractor in the 50s that 15% of his contracting bids were for payoffs. Slowly, like the water that seeps up in quicksand, the political level of mafia entanglement in politics rose. When the CIA got into the drug distribution process with Nicaragua, do you think they got out?After assisting with what is now conceded to have been their role in the Kennedy assassination, do you think they never called in any of their IOUs? The Clinton ploys in Arkansas are well known, but that was when he still was in the peanut gallery. And the CIA apparently wasted no time making it clear to him who ran the show and what kind of money was involved for those who went along. Prescott Bush was a financier of the rising party in the 1930s Germany, but his rich son, fresh from the CIAwas elegant and well universitied. Their gambit was on the level of oil, but we didn’t go into Afghanistan for oil. There was none. What there was were the nasty Taliban who had declared heroin anti-Islamic and shut down the bulk of the world’s supply. That was prong One. Prong Two was the oil exploration rights, Iraq’s, which the over-egoed Saddam had sold to China, Russia, and France. In no time flat after we had taken over the government in Baghdad, those contracts were voided, an American company got the new contracts and sold them for billions to the same entities they’d just kicked out. Sound a bit like the current business method? However the point that has most piqued my interest is the trip that Hillary made as Secretary of State where she conferred with both the past and current controllers of the other 20% of the world’s supply of heroin in Burma (Myanmar.) Whatever she thought she heard was interesting enough that she returned to DC and quickly returned with Obama in tow. Whatever they heard from the Generals convinced them that the nice Burmese lady, Aung San Suu Kyi, who was their alleged reason for the visit and for the conversations would be released from house arrest. What else did they hear or think they heard from the Generals who had replaced Suu Kyi’s father in a coup and who controlled the vast billions of the heroin trade? Previously Burma was the main supplier to China. Not long after that visit a heroin epidemic struck America. The possibilities are complex, but fascinating. I’d love to find a journalist with the courage to break this. Their are a lot of loose leads that no one has tied together. In a nutshell, I think the mafias have risen to the top. Apparently, Barr is a long time DC inside operator, and is friends with Mueller. Maybe there’s some angle here of this BS Russian collusion thing being smoothly dispensed with in a way that deters House Dems from mounting phony impeachment issues. Who knows? It’s interesting in a kind of “solve the puzzle fashion”. Another crooked critter surfaces in the fetid waters of the Washington Swamp. Corruption is the lifeblood of American politics. May God bless you 10,000 times for this “Gate – Opening” piece, Sam Husseini !! — Thanks, also, to the editors at this site, for publishing this propitiously insightful chronological comparison of events.